Departing from the station January 7, 2018! 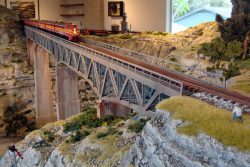 Create holiday memories by travelling across Texas by model railroad in this scratch built “O” scale model. The multiple trains crisscrossing the state will visit important and unique places in the state’s geology and physiography. Destinations include oil country salt domes, prairies and wetlands of the Texas coast and state and national monuments such as Enchanted Rock, Pedernales Falls, The Balcones Escarpment and Big Bend National Park. Along the routes to these geologic wonders the trains will also pass through Galveston, Houston, Dallas, Fort Worth, Austin and San Antonio with other surprises along the route. This exhibit (the size of a tennis court) is the largest indoor “O” scale model railroad in Texas. Don’t miss what is sure to become a holiday tradition!